There have been a lot of stories of lost boaters lately. Please don't become another statistic. With 21st-Century technology, getting rescued has become a lot easier. But you still need to be properly prepared. Here's the basics on a must-have item: the Personal Locator Beacon. If you're looking for fishing tackle, dive gear or just need a good hat, this is the place to visit first. Stores in Kalihi and Pearlridge Downtown. Or visit their website at HanapaaFishing.com. Although their specialty is bluewater trolling gear, they're also known for their wide variety of custom rods for ulua fishing, fly fishing, bait casting and more. They also do repairs. Check them out at their store at 24 Sand Island Road. Or check them out on FaceBook: 5 Oceans 7 Seas. Distributors of the civilian version of rations used by the US military. Extremely convenient, hot when served and surprisingly tasty, the prices for these meal packets are on par with the average plate lunch. With a five-year shelf life, they're also invaluable as emergency rations. SixEaglesHawaii.com. You've probably found yourself in a situation where you're fishing overnight on solid rock. There's no flat ground to pitch a tent, and you want to get at least a little shuteye until the bell rings. Ventura Camp Systems has a great solution in their Cabin Cot. 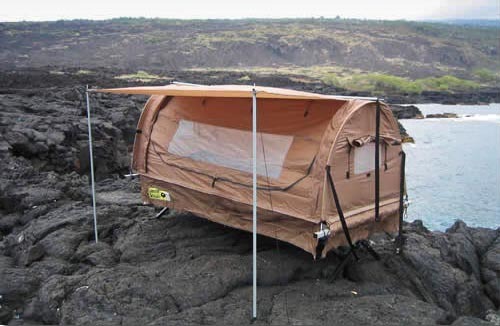 It makes use of your existing military-style cot to create a handy one-person shelter. You're out of the wind and rain, and off the rough stuff. You've seen his prints grace the walls of restaurants and other fine establishments throughout Hawaii. And they have become invaluable keepsakes within families. Naoki's gyotaku art, or fish prints, goes beyond the traditional Japanese art form and brings these life-sized impressions back to life. Should you ever need a new engine installed or just have to get an older one repaired, give Sandy at Central Marine a call. In addition to doing some of the best work around, she will actually insist on having you take her out on a sea trial to make sure everything runs exactly right. She has a small shop but can do it all. Over the past several years kayak fishing has grown in popularity everywhere. One of the organizations that wants to make sure it's done safely is Aquahunters.com. Their website has a wealth of information on how to do it, how to stay safe, what to get, and what they're getting. It's a fun way to fish offshore and not go broke paying for gas but it does require some physical stamina and having a good knowledge of one's limits. Isaac "Rocket" Brumaghim in Waianae. Fishermen have been helping the Division of Aquatic Resources tag papio and ulua, and are also tagging oio. 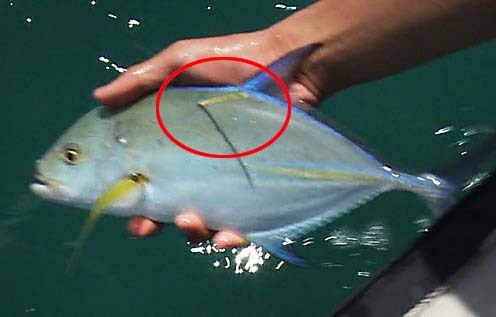 If you caught a fish with a tag in it, here's what you should do (click here). For regulations and information about fishing here in the Islands. Perpetuating the culture and lifestyle of fishing. If you're interested in preserving fishing for your children and grandchildren then please join and support this organization. Whether you're interested in big-game, blue-water sport fishing or just want to go out and have a nice time in calm litoral waters, there's probably something here that will suit you well. These people are really good at what they do! The familiar musical theme for Hawaii Goes Fishing was composed and recorded by Audy Kimura. audy@audykimura.com. You can see him perform Wednesday - Saturday at Hy's Steakhouse in Waikiki.